Synopsis: Mars has been terraformed to the point that it can finally support life. While many human settlements have popped up, the most famous city on Mars (now called Aqua) is Neo-Venezia which draws its inspiration from the city of Venice on Man-Home (formerly Earth). Neo-Venezia is a huge draw in part because of its tour guides, the Undines, who take passengers on a tour of Neo-Venezia along its canals in gondolas. 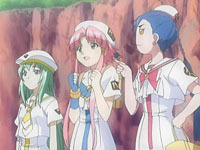 The story follows the lives of Akari, Aika, and Alice, who are all apprentice Undines hoping to become fully-fledged gondoliers so that they may share their love of Neo-Venezia to tourists. 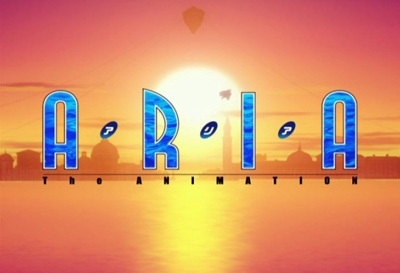 Review: ARIA the Animation is a slow-paced show that nevertheless manages to grab at the viewer’s attention early and hold it. Its goal seems to be to get both the viewer and the characters to gain a better appreciation for the city of Neo-Venezia’s peaceful, serene atmosphere and it largely succeeds at doing just that. Furthermore, ARIA’s setup allows the viewer to enjoy the characters as they follow the characters through their day-to-day routines. 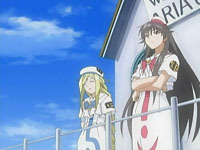 This show’s approach to the slice-of-life genre is certainly unique in the way it sets up the stories which revolve around normal events in the lives of apprentice gondoliers. 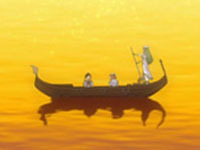 The series is fairly episodic and there isn’t much to tie one episode to the next save for the characters’ goal of eventually becoming fully-fledged gondoliers. But to say that this show lacks any apparent focus would be false due to the way each episode is structured. Despite its focus on seemingly normal events, ARIA excels when it comes to conveying its overall theme of extraordinary ordinariness. All of that comes about because of how the characters are handled. Although the characters’ personalities are set in stone early on in the series, the manner in which the characters interact with the world around them is what sets this series apart. The characters are fairly likeable and one gets a feel for what makes them tick early on, allowing for a seamless understanding of where they’re coming from as they interact with their environment. That aspect is crucial to appreciating both the characters and the plot because it’s the characters’ curiosity, sense of wonder, and enjoyment of life that really makes their small, perhaps even mundane discoveries seem so wonderfully special. In doing so, the show succeeds at conveying the sense of joy that the characters feel, which means that the viewer can’t help but also share in their delight. However, the tradeoff is that once you get a feel for their character, they remain fairly static though the series does make some efforts to explore their characters a bit further. Akari will stay a happy-go-lucky eternal optimist, Alicia will still be the laid-back, kind-hearted mentor, Alice will still fluctuate between being sarcastic and being funny in a deadpan manner, and Aika will always try to keep up a wall of seriousness and ambition about her. With these kinds of simple traits, it’s likely that you will have seen characters similar to them elsewhere. Nevertheless, the way they are allowed to bounce their personalities off of one another is what makes this series so enjoyable and charming as they experience the joys of living and training in Neo-Venezia. Things would not have been complete without the brilliant artwork and the soundtrack to complement the laid-back nature of the series. The backgrounds are just absolutely detailed and it’s pretty easy to just be taken in by the sheer beauty of Neo-Venezia’s landscapes, buildings and waterways. Furthermore, the soundtrack, filled to the brim with mellow guitar music and soothing piano pieces, bring forth ARIA’s laid-back, mystical atmosphere. The Choro Club and Takeshi Senoo deserve a lot of praise for their ability to put the viewer in the right mood. ARIA the Animation is just one of those series in which nothing really takes place but you don’t really mind because its execution, beauty, and grace make for a very charming series. It’s easy to allow yourself to be swept into the series’ atmosphere so once you begin watching it, be prepared to relax and immerse yourself into the enchanting world of Neo-Venezia. This is one of the most beautifully animated series I have ever seen. That and the soundtrack draw you into a peacefull viewing experience. I can’t help but feel that your review misses the “heart” of Aria. Most of the characters who live in this world go about their day to day lives, and take the beauty of their world for granted, if they notice it at all. Which is why the story wouldn’t if it hadn’t been told from Akari’s point of view. The story starts with Akari arriving on Aqua, and from her first sight she is filled with the wonder of everything around her including those things everyone sees as everyday happenings (as well as the extrordinary). Taken on it’s own Aria is a great series, but I try to take Akari’s lessons to heart, and try to see what I’m missing in the everyday around me. I blame that for a general lack of experience, since that was something I wrote close to 3 years ago. I can only hope that my analytical skills have improved since then. On a related note, I have touched on ARIA’s soundtrack, so if you get a chance, do feel free to put your thoughts on the ARIA the Box review.